A pure vegetable, cod liver oil and lanolin base. Soothing relief for skin irritations, fungi, falling hair, itching eczema, hot spots, moist feet and ears, ear mites, pus pimples, and severe mange. Use on stubborn cases where others have failed. 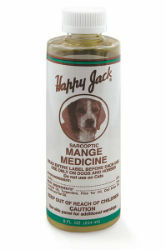 Mange Medicine is the closest thing to a cure-all for skin diseases. Although called Mange Medicine, this product is effective against a broad spectrum of skin conditions completely unrelated to mange. For use on Dogs and Horses.